Subfascial breast augmentations are a relatively recent development that has frequently captured the curiosity of patients. This Brazilian technique introduced by Dr. Ruth Graf avoids frequent disadvantages with other techniques such as high, “fake”-appearing implants, implant distortion or “animation” with exercise, and a longer recovery period. Every muscle in the body has a particular shape, regardless of the size. This is due to a very thin, yet extremely tough, durable layer of tissue called fascia. The subfascial breast augmentation employs this layer and uses it to protect and support the implant, without removing the muscle attachments from the ribs. Many times, implants placed under the muscle initially have a “high-riding” appearance and may take time to settle into their final position. Another benefit of the subfascial approach is that the implants are instantly placed in their correct positions, which reduces downtime. Has less post-operative downtime. Generally, patients can return to work after 2 or 3 days, and are able to work out at 2 weeks. 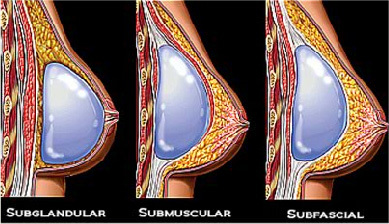 If you are considering breast augmentation, please contact us to see if subfascial breast augmentation is the right choice for you!